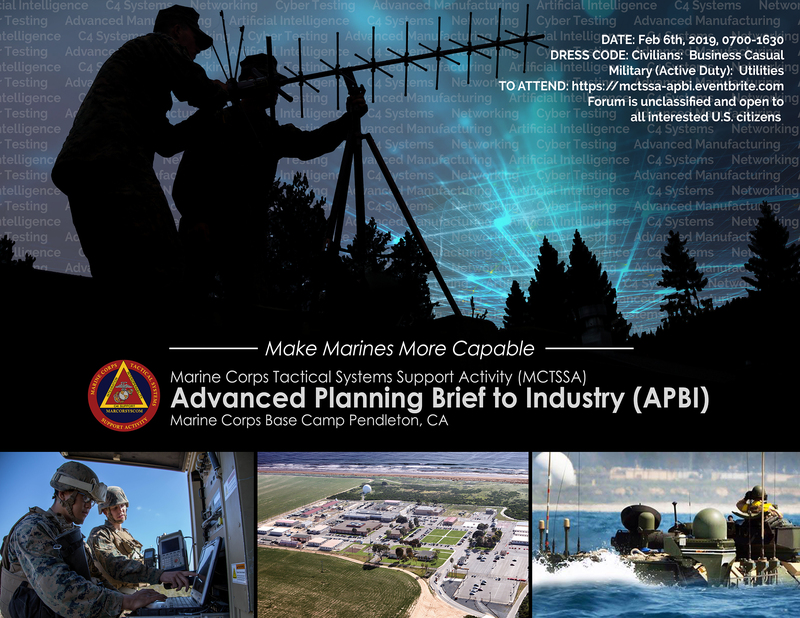 Marine Corps Tactical Systems Support Activity (MCTSSA), will host an Advanced Planning Briefing to Industry (APBI) on February 6, 2019, at MCTSSA, Camp Pendleton, California from 0800-1630.MCTSSA, a subordinate command of Marine Corps Systems Command (MARCORSYSCOM) provides test and evaluation, engineering, development, and operating forces technical support for USMC and Joint Service command, control, computer, communications (C4) systems and current and future amphibious vehicle platforms throughout all phases of the acquisition life cycle. The goal of the APBI is to communicate to industry MCTSSA’s mission, organizational structure, current and future contracting efforts in order raise awareness, identify technical challenges and to promote potential partnering and networking for large and small businesses. The APBI is a one-day event. A general orientation session will be conducted, followed by a walking tour of the facilities. Attendees will then select briefings of their choice to attend. Multiple briefings will be provided every 30 minutes during the morning and afternoon sessions. The event will conclude with follow up discussion or questions with the MCTSSA’s Command staff and briefers. APBI briefing abstracts will be available one week prior to the event for review. The Government will not hear formal or unsolicited proposals from industry during the APBI.The APBI is unclassified and open to all interested contractors, large and small businesses, academia, as well as other government stakeholders who are U.S. Nationals. Attendance will be limited to two representatives per company. Companies are encouraged to submit a capability statement however it is not a requirement for attendance.